A group from CAFNR is helping develop master's programs for Moscow State University in Russia. Photo courtesy of Claire Schneeberger. The University of Missouri College of Agriculture, Food and Natural Resources is at the forefront of research and education – and that reach is extending globally. A group from CAFNR is collaborating with the Eurasian Center of Food Security, based out of Moscow State University, to develop two online master’s programs, both focused on food security needs in the Eurasian region. The two programs developed by CAFNR incorporate agribusiness management, and land and water resource management. 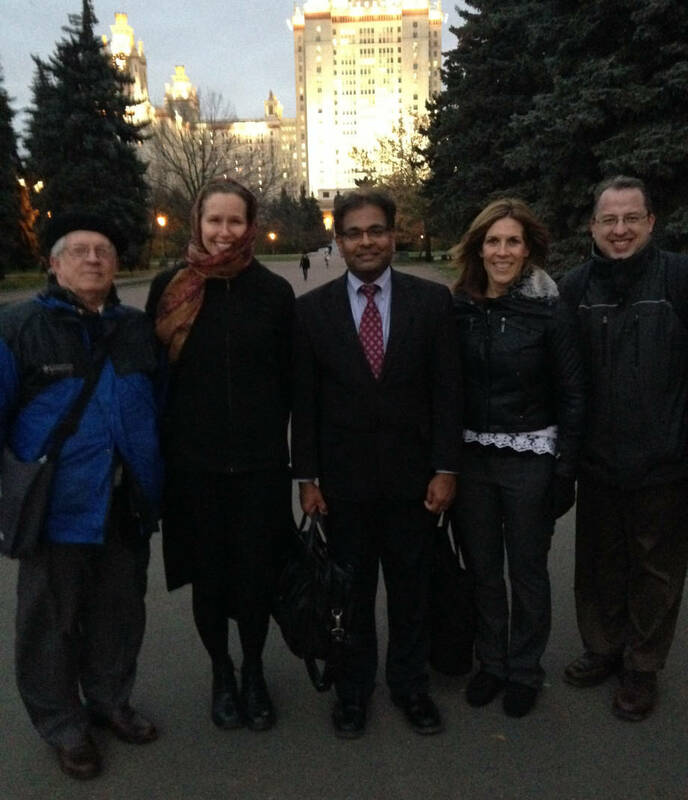 Ball was one of four CAFNR representatives who recently traveled to Russia to meet with Moscow State faculty members and deans. Also attending were Willi Meyers, director, CAFNR International Programs; Harvey James, director of graduate studies, agricultural and applied economics, Division of Applied Social Sciences; and Shibu Jose, director, Center for Agroforestry. After developing a desire to focus more on sustainable agriculture, Moscow State and the Eurasian Center for Food Security worked with The World Bank to fund the project. They made a worldwide call for proposals for the project. The World Bank offers help to several countries with capital projects, through loans, advice and other resources. CAFNR is developing two master’s programs for Moscow State University, focused on food … Expand ▸CAFNR is developing two master’s programs for Moscow State University, focused on food security needs in the Eurasian region. Pictured, left to right: Willi Meyers, Claire Schneeberger, Shibu Jose, Anna Ball, Harvey James. Photo courtesy of Shibu Jose. Collaborating with Monarch Media, CAFNR put in the strongest bid. Monarch Media, based in California, has experience with the design and implementation of online learning, and will eventually translate the entire project into Russian. They are managing the project. Monarch Media was founded in 1997 by Claire Schneeberger, who is leading the project and headed the visit to Russia with four CAFNR representatives. Monarch Media is an industry leader in developing online projects. They specialize in the type of project that Moscow State was looking for. CAFNR, a sub-contractor on the project, is creating the complete curriculum plan and materials for the master’s classes. Developing two master’s program is no simple task. Jose and James are each heading a master’s program, with several other faculty members involved in the process. Jose is overseeing the land and water resources-based program and James is overseeing the agribusiness-based program. Online programs are something with which CAFNR has plenty of experience. Moscow State does have online courses but wanted external expertise to assist in developing degree programs focused on food security. The programs will target students in Russia and especially in Central Asian countries that were formerly part of the Soviet Union. Moscow State and the ECFS also wanted the programs developed faster, and was looking for help in that regard. That made the Monarch Media and CAFNR joint effort the best choice for the project. CAFNR began the basics of the project in August – and will have it finished by the end of June. That quick turnaround is due to the experience of the individuals working on the project and the willingness to work together each step of the way. Ball is serving as the educational designer on the entire project. Her group is working with faculty members on various items within the project. Ball is also working closely with Monarch Media. Ball added that Moscow State University’s master’s programs differ from the ones offered at MU. Schneeberger also travelled to Russia with the CAFNR group, where they met with Moscow State faculty along with several World Bank representatives. The trip lasted from Oct. 27 to Nov. 2. 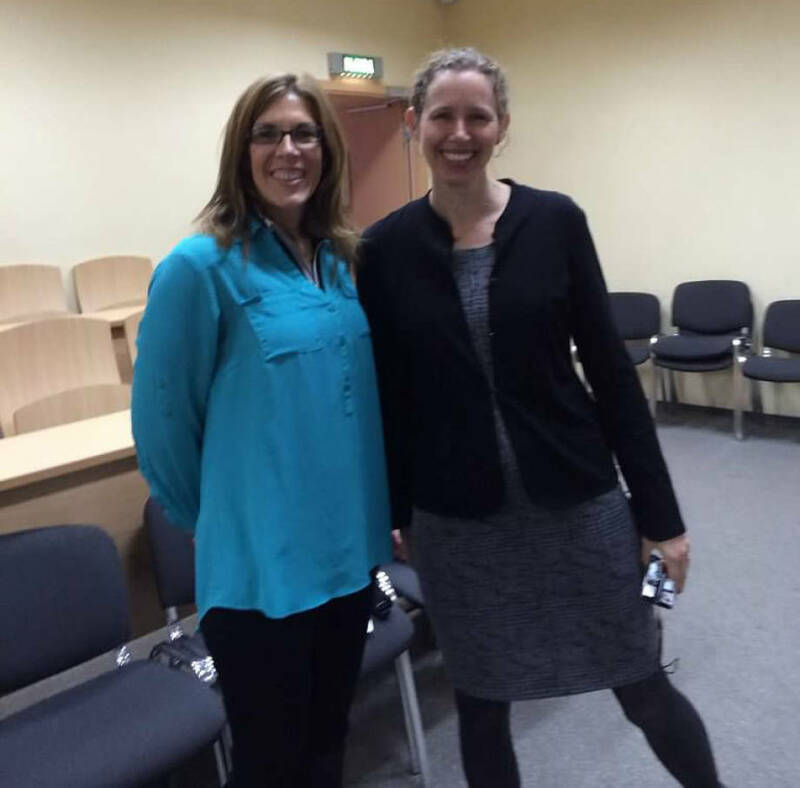 Anna Ball, MU, and Claire Schneeberger, Monarch Media, snap a quick picture together in Russia. Photo courtesy of Claire Schneeberger. The different sides met to go over everything CAFNR and Monarch Media were working on – and to make sure it met Moscow State’s standards. The meeting was successful, with CAFNR receiving positive feedback. Jose added that CAFNR continues to work with Eurasian regional experts to get a better understanding of the agriculture and natural resources in that part of the world. He said that CAFNR is excited to collaborate with Moscow State, and they want the university to take charge of the programs. James added that the collaboration has been successful thus far.